When: Every Thursday evening at 7pm. 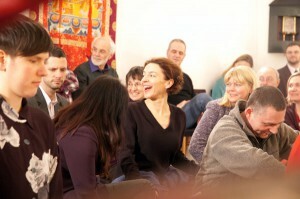 This Weekly Dharma Gathering is a perfect introduction to the Shambhala Buddhist teachings and an opportunity to connect with other practitioners. It begins with a group meditation practice, a talk by one of our senior teachers, discussion, and a reception. The Open House is an opportunity to meditate in a supportive group setting, to learn about how to apply the principles of meditation to everyday life, and to meet and mingle with fellow practitioners. Bring your friends! Cancellations and rescheduling will be announced as needed on the home page. If you’re unsure where to find us, directions to our Shambhala Center are located here.